Carcharadontosaurus, a relative of Mapusaurs from Africa. The last week or so I've been engaged in a discussion about theropods living in groups with a fellow blogger and Paleontologist. Basically it boils down to this. Since birds and crocs are dinosaurs closest relatives we should only use them it infer any behavior and biology. I disagreed and lots of comments and emails were exchanged. I was given a copy of the 2007 Deinonychus paper. A paper which is supposed to explain the feeding habits of Deinonychus. In it, the paper basically uses the ora, or what we in the west called the Komodo Dragon, as a comparison to the kill site were the 'raptors' were discovered. 4 raptors were found along with the carcase of a juvenile Tenontosaurus. The original idea being that the tenontosaurus either fell on or killed the 4 in the attack that cost it it's life. The fell on thing is kind of strange but the site is odd in itself. It appears that one fo the raptors 'killing' claws was imbeded in the tail tendons of another raptor. There were lots of shed teeth so we kow more than the 4 raptors were present. The paper argues that this site is simiar to ora kill sites, as the ora is know to be canibalistic and they explain the site as a single raptor killing the Tenontosaurus and then the others coming in and a sort of feeding frenzy ensued, during which things got out of hand and 4 of the raptors were also killed. 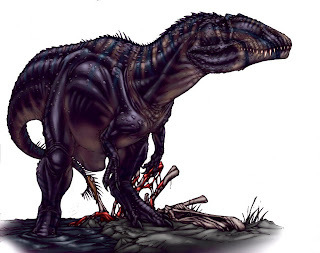 We are told from this we can assume that this is how EVERY theropod dinosaur should now be interpreted as acting, single hunter and then a group comes in and they fight over and eat the kill, just like oras. It should be the 'fall back' position. I disagree. While the site is strange an equally plausible postion is a rival group of raptors showed up and a fight ensued. It explains the shed teeth, the claw in the other raptors tail, and the 4 dead animals. Am I sure of this..? No, but it's just as likely. The point is we don't actually know. It's a guess, an educated one but it's still a guess. But to claim that EVERY theropod should be cast as having the same exact behavior is just at odds with ALL other animals. No predators, even closely realted ones, act exactly the same way. Most birds hunt alone, but some hunt in groups. Some live alone, others in groups. The Ora is a strange animal, it's the heaviest lizard, it lives on a small island (or group of islands) with very limited resources, it's now found to be venomus. It's cold blooded. Not very similar to theropods, who had much greater resources, continents to roam around on. Were most likely warm blooded, and not venomous (that we know of.) To just use the one lizard is just wrong. Other veranids don't behave that way, even ones closely related to the Ora. I fail to see how this should be the fall back position and how this is good science. Good science should say we don't know... We have some evidence for some theropds living together, but it's open to interpretation. Case in point the Mapusaurs site. 7 individuals of various ages. were found burried together. I was told this shows a predator trap, but in every other predator trap (similar to the Le Brae tar pitts, but no tar) there are more than one speices of predator. In fact we have traps like this in the US, one in Utah with LOTS of Allosaurs, some ceratosaurs, some sauropods, a Torvosaurus... lots of different animals, this is a classic predator trap. But to find 7 individuals with no signs of canibalism.. no other animals... a trap that just caught one specific animal around the same time??? That's the best explination? Not that they were living together and were all killed at the same time via flood or volcanic gas or whatever? I'm even will to say we don't know for sure and will most likely never know, unless the bones were all jumbled together, that would mean they most likely died and decomposed together. But that's all we'll ever know for sure. I keep being told that we can't use mammals for anything related to dinosaurs. But I just read a very interesting post over on Tetrapod Zoology about the neck posture of sauropods*. It turns out THEY used mammals for their comparison. Wait weren't we not supposed to use them?? And then in another post, Darren mentions another new paper about reptiles and birds playing... and how did they kow they were playing... why they were comapared to mammals of course! So what I'm being told is, it's only ok for SCIENTISTS to compare mammals to dinosaurs, just not some frindge artist who doesn't know any actual science. I wouldn't have brought this up but the person I was arguing with has felt compelled to mention it on their blogs at least 3 times already, even after the papers comparing mammals to reptiles, birds and dinosaurs. I can't really comment there because it isn't in English and the translators are really bad. So I can't be 100 percent sure of what is being said, so I have to go off what I've gotten in English here. I am of course, willing to change my mind when and if good evidence is ever found. But for now what's there is less than convincing, even to this frindge artist. * Disclaimer: This paper used turtles, lizards, crocodilians and birds and mammals for neck postures. I focused on the mammals to prove a point. Very good post, although (as you know) I disagree with in some points. I've never said that "Since birds and crocs are dinosaurs closest relatives we should only use them it infer any behavior and biology.". Nor other palaeontologist ever said that: we said that crocs and birds are the best analogues (and homologues) for inferring dinos behaviours, but not the only one. At the same time, we note that mammals are often cited without good evidence supporting an analogy with dinosaurs. The evidence of playing reptiles strongly support our idea that it's not necessary to cite mammals for interpreting complex dinosaur behaviours. It is important to note that we use all tetrapods for dino reconstuctions, including mammals, following a methodological protocol called "Phylogenetic Bracketing". The study on sauropod necks you cite does not use ONLY mammal, nor ONLY birds/crocs, but all tetrapods, that are compared to dinosaurs following their degree of relationships with the latter animals. The Deinonychus article never said that ALL dinosaurs were like oras: to the contrary, it said that the most parsimonious explanation of the avalaible data is the ora-crocodyle-birds behaviour, and not the wolf-lion one, PENDING NEW DATA AND FUTURE EVIDENCES. This is a prudent approach, not an "anti-mammal" dogma. The Mapusaurus site has not yet studied in details, and, as far as I know, nobody ever claimed that it lacks any evidence of scavenging, so, you cannot say that there's no evidence of cannibalism. Note that the absence of other predators or species in that site is a good indicator of cannibalism: it is as plausible at least as the pack hypothesis (and is better supported by analogy with other modern big reptiles). 'Very good post, although (as you know) I disagree with in some points. I wasn't sure, and since I didn't see my name mentioned I didn't want to assume. :) I figured you would disagree but after looking this over I don't think we're actually as far apart as I thought we were. Ah, but if that what was said then I really wouldn't have had much of a problem. All the posts and comments implied, to me at least, that using mammals was not scientific. I believe you mentioned something like why not use bats or shells...? I agree with you, using birds and crocs for things like breeding and brooding and the like. Dinosaurs laid eggs, so they would behave more like egg layers. Yes, that's great, quite an interesting study! Unfortunately that info was only published very recently so I wasn't aware of it. But at the same time if mammals weren't used, then the playing reptiles would not have been noticed. And you can argue that the ora, while really interesting, is not exhibiting natural behaviors. It's fed, has no predators, it can afford to play while in the wild the animal would be scrounging for food. But even this limited play can only get you so far. I love monitors, they are quite interesting but it's the fact that the ora was used and not another species that's buggin me. If they had used an argus or lace monitor, then I might be on board with you, but the ora is too specialzed and isolated for me, it's not 'general' enough. I'm not actually arguing for all dinosaurs, just the theropods, as most dinosaurs were herbivors. If they would have said crocodyle (which I wouldn't agree with) and bird (some of whom will hunt in groups) I wouldn't have had as big a problem with it. But once the analogy with the oras started, that's all they used. It's like they had decided before hand and then used the evidence that best fit the idea. This again might be the language translator. But it appears that all the post on your blog are anti mammal about this. That's how it comes off, but again that might be the translator, which is why I haven't really said anything there. I figure that if there was evidence for cannibalism, it would have been mentioned. But I did ask you about that, since I've heard nothing about cannibalism for this particular site (I figured you'd know more than I did about it, and Coria wouldn't be saying 'pack' if they did find evidence for cannibalism.) If there is, then that would toss the pack idea out the window and I would be agreeing with you. At least for Mapusaurus;) But I don't consider theropods reptiles, I consider them birds. And I think that might be the differnence. After readind this series of very interesting discussion with you, I think our positions are not so very different as I though before. In summary, our approaches are different mainly because I would like to use only analogues that are corroborated by the Phylogeentic Bracketing and avoid other hypotheses PENDING NEW DATA (that means: I'm NOT saying other explanations are wrong! I would use mainly those supported by avian and reptilian analogues before assuming behaviours from other animals being less "dinosaur-like" in morphology and physiology than crocs and birds). I agree with you that more studies on modern reptiles and birds behaviour will help to undertstand dinosaurs (for example, more studies on other varanids and crocodyles): in my opinion, mammals have been over-estimated because there were few studies on reptilian ethology (probably because they've been considered a "primitive minds" and lacking at all any kind of complex behaviours). Modern reptiles, as I wrote in a recent post on Theropoda, are more complex and interesting than we usually think, and could help us in understanding dinosaurs more than mammals, if we stop thinking they are "primitive" or "too simple-minded". Honestly, I don't think comparing dinosaurs to mammals is in any way wrong or unscientific. Most modern mammals evolved from reptilian ancestors anyways. Not necessarily dinosaurs, but they were reptiles. And since most of the planet's animal life is mammals, it's most we've got to work with in terms of predictions. And I also have to agree that using an animal that is completely isolated and is the top predator in its area isn't exactly the best behavioral prediction. Deinonychus was most definitely not the top predator of its time, so it's not the best comparison. Sorry if I make no sense. xD; My attempts at making scientific sense never seem to work out so well. Comet, I disagree with two parts of your comment. 1: Mammals did NOT evolve from reptiles. Mammals are a lineage of derived synapsids, a group of terrestrial vertebrates that is not a part of the reptilian lineage. They're a DISTINCT lineages. The mammal body plan and the reptilian one diverged both from their common ancestor (an animal that was a tetrapod but neither a reptile or a synapsid) more than 300 million years ago. Old taxonomy erroneously placed synapsids into reptiles, but that is not correct, they are sister taxa. Saying that mammals derived from reptiles is erroneuos as saying that crocodyles are derived from birds. 2: Most of the planet's animal life is NOT mammals. There are 5000 species of mammals today, but also 5000 species of anfibians, and 10000 species of birds, and 20000 species of "fishes", AND more than 800000 species of insects, and so on... You're overestimating the mammal importance and diversity among the animal kingdom. I know a (very) little French. In my opinion, the differences between French and English languages are less than those between Italian and English. This could explain why the English translator worked better with French than Italian. The Spinosaur site (I suppose is Christophe Hendrickx's one) you cite is very good! That's the site! I was really interesting, he's put together a lot of evidence. It might explain Spinosaurus great size. Ah. xD Well then my Biology book is a load of crap. Ah well. And I guess it would be more the age of the insects then.